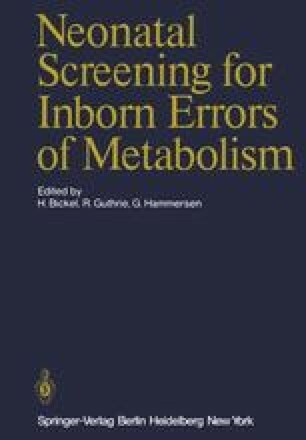 Measuring T4 from the eluate of 10-mm diameter dried blood samples was initially used in screening for neonatal hypothyroidism (Dussault and Laberge 1973; see also related article p. 167ff in this volume). We have previously reported about methodologic factors and limitations involved in using such a technique, involving a dried blood disc 10–13 mm in diameter (Walfish 1975, 1976; Walfish et al. 1975). Using a smaller disc of only 1/8 in. (3.2 mm) in diameter was subsequently proposed (Larsen and Broskin 1975) and has a number of theoretical advantages, as can be seen in Table 1. We therefore developed our own double-antibody radioimmunoassay (MS) to measure T4 in a single 1/8-in. diameter disc and compared our results to a commercial solid phase radioassay (Concept 4, Micromedic System).